Saying that certain Blimpie's sandwiches do not live up to advertising claims, Ronald Williams and Jennifer Clayton have sued the chain's owner in Madison County, Illinois, on behalf of a class of similarly situated consumers. (If any.) Plaintiffs claim that the "Super Stacked" sandwiches are advertised as having twice the meat of their more poorly stacked cousins, but in fact do not. 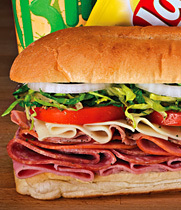 The plaintiffs' sandwich experts, likely having exhaustively tested a scientifically valid sample of Blimpie's subs in accordance with detailed rules established in 1896 by the International Bureau of Sandwich Weights and Measurements, have concluded that a 12-inch Blimpie's Best sub has 50 grams of protein, and a 12-inch Blimpie's Best Super Stacked has but 73 grams. (Did you know that Blimpie's workers carefully construct each sandwich according to a template and using sandwich-construction tools that are both accurate to within one gram? It's true, depending on what you mean by "true.") The doctors of culinary engineering further conclude that 50 is less than 73, and 73 in turn is less than 100, and are willing to so testify under oath when and if called upon to do so. Note: The above paragraph has approximately double the sarcasm content of the ordinary Lowering the Bar paragraph. (And that also has been measured by an expert.) This has been provided at no additional charge to you, the reader. Plaintiffs also claim that other "Super Stacked" sandwiches should not be called that because there are in fact no regular-sized, ordinarily stacked equivalents to which they can reasonably be compared.